The Kallawaya (also known as Callahuaya, Kolyawaya, Qolla Huayu) is a culture native from the towns of Curva, Chajaya, Khanlaya, Huata Huata, Inka and Chari, in the surroundings of the town of Charazani, in the Bautista Saavedra province of the La Paz Department, Bolivia. This natural setting is one of the most spectacular, unexplored and unexploited natural regions that remain on the planet. The Kallawayas are the guardians of a practically undisturbed biological corridor that runs all the way from Titicaca lake, up the glaciated peaks and lakes of the Apolobamba Mountains and down the steep ravines into the most remote mountain and flood plain rainforests of the Madidi National Park. Theories about the origins of the Kallawaya culture point out to similarities with the Mollo Empire that originated on the steep valleys of the central Andes. 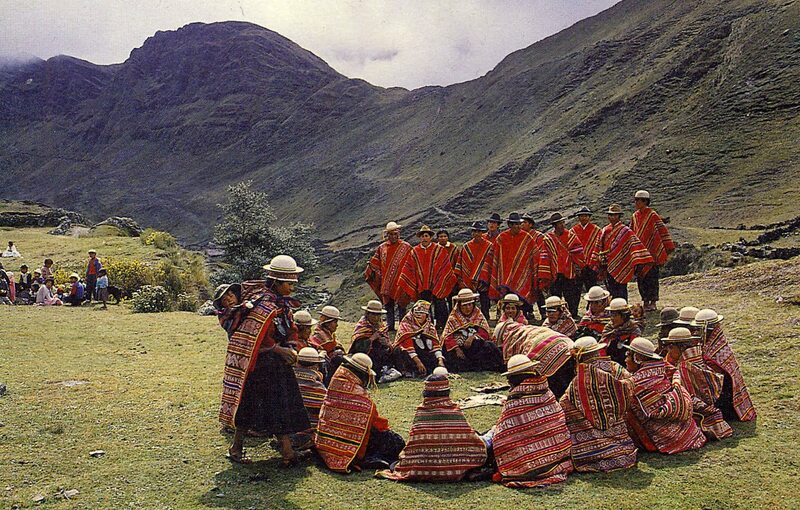 Kallawayas speak Quechua, but their cultural traits and practices are more of similarity to the nearby Aymara. Spanish is their second language and some have Aymara as a third. Those that are initiated into the healing and shamanic practices are taught the sacred and secret Kalliwayai language that is only used in prayers and ceremonies. The few linguists that have been able to study this language state that it has a Quechua grammatical base, but that it integrates words of Pukina, a lost language that is thought to have been spoken in Tiwanaku (the most remarkable civilization that flourished in the central Andes according to official anthropology from 1100 B.C. to 900 A.D). Immemorially, the Kallawaya culture has centred itself in the study and practice of traditional itinerant medicine, and its healers travel through the Inca roads in search of medicinal plants and taking their healing practices to those who need it in the farthest reaches of the continent. They have been known to travel on foot as far as southern Argentina and as far north as Colombia. It is known that the Inca royalty had Kallawaya healers in Cuzco to attend their health issues, and they became most famous when, in the 1900’s, were taken to the Panama canal to help treat the Malaria pandemic for which only they were able to treat and successfully heal using only plant remedies. The UNESCO declared the Kallawaya culture as a masterpiece of Oral and Intangible Patrimony of Humanity in 2003. A Kallawaya shaman can be hired to be the spiritual spokesperson if you desire to communicate with the spiritual realms of the Andean world. Their fluid use of their sacred Kalliwayai language is used in constant prayer along with an elaborate symbolic ritual employment of amulets as a dialogue to speak to the sacred power places and spirits, calling their attention to help a patient in need, or a young fellow looking for love. Those sceptics that have studied this extensive shamanic ritual practice have come to the conclusion that independently of the magical and spiritual effect these rituals may have, if any, they have a profound psychological therapeutic use, and this by itself is enough to make this practices effective and recommendable. Kallawaya medicine shares different practices, viewpoints, beliefs and knowledge marked within a sanitary system that includes plants, animals, minerals, amulets; based on ceremonies, spiritual rituals, hand-applied therapies applied in singular fashion and/or a combination of all of these to help the well-being of their patients. Their diagnose methods are as varied as the types of therapies they apply, which can go from physical examination of the patient, to magical and ritual divination techniques used to diagnose not only the ailment, but its source. The Kallawayas drew attention to themselves due to their extensive pharmacopeia, believed to be the most complete of all indigenous nations. But Kallawaya healing goes far beyond from herbal remedies and therapies used to treat the physical body. This is where the badly used term “shaman” can be applied to these medicine men. Not only are they well-formed doctors and physical therapists, but have an extensive use of shamanic ritual, psychological, and ceremonial healing. Their role of healers and shamans is crowned by their social function as “priests” of the Andean world. Different ceremonies that have nothing to do with healing are carried out by the Kallawayas, like weddings, baptisms and funerals. Modern day Kallawayas continue to exist to this day without mayor changes in their ways and lifestyle from the days of the Incas. Native to Bolivia, it is in this privileged country where you may find a Kallawaya healer permanently stationed in every mayor city. La Paz is a good example, where up to five Kallawayas have their private consulting room to attend people indifferent of their origin. 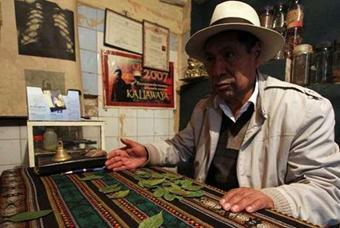 A consultation can include divination with the use of coca leafs or cards (depending on the day). In case a herbal therapy or ritual is needed, they will provide the plants necessary. In the most complex cases, it is recommended to travel to the Kallawaya’s village where he will have easier access to the items and energies necessary to carry out the healing therapy or ceremony. Although Kallawaya medicine men normally attend mostly indigenous people who believe and respect all aspects of the Kallawaya practice, these medicine men are open to heal and treat people regardless of their origin or spiritual belief. The main reason why travelers to Bolivia don’t take advantage of this unique healing opportunity is because they don’t know of its existence, and because of the language and cultural barriers. Having spoken to a Kallawaya medicine man, we have agreed to begin building the necessary bridge to be able to offer people from all over the world the opportunity to heal all imaginable ailments with the Kallawaya wisdom. In retribution, the Kallawayas can expand their client list which each day becomes shorter, and thus their existence becomes endangered due to the expanding and self-imposing western medical practices and pharmaceutical remedies. In addition, the Kallawaya culture’s magical and medicinal practice is strengthened by taking healing success stories to other countries and thus helping their heritage and cultural recognition gain respect amongst different people and cultures. Native Journey is the intercultural translator and national operator that is beginning to build these cultural bridges, offering you the opportunity to travel to Bolivia and experience and understand Kallawaya healing practices regardless of you speaking Spanish or having previous knowledge of the Andean culture or any type of shamanic exercise. We invite you to live this millenary, authentically native healing experience.